Goo. 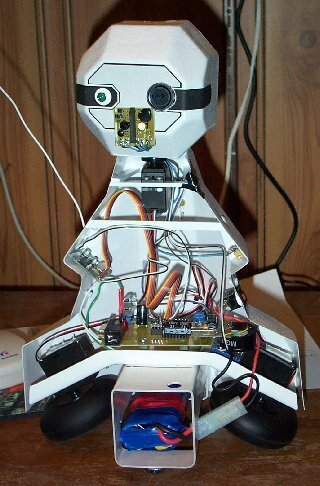 Basic Stamp II powered robot. which is decoded to 8 seperate control functions. schematics are available on web page. which allows him to be driven remotely. built inside for a portable hand-held controller unit. for more details on construction and programming. $24 - 3 model airplane servos, 2 modified, 1 not. $25 - 12v rechargable battery pack - Homemade. $99 - X10 video camera trans/rcvr - modified. $30 - Goo Shell,  see web page for details. $7  - Black and white TV,  on closeout at AMES. Misc junkbox parts, led's, switches, wheels, etc. had to increase to 12V. Cramming everything into 5" TV was fun. Time to build:  3 days after work.